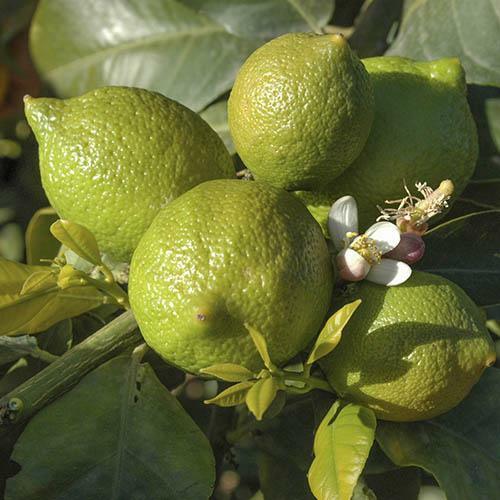 Pick your very own delicious fresh Limes and add a Mediterranean feel to your home or garden! Packed full of vitamin C, these fruits are not only delicious, but good for you as well! Use your fruits in everything from freshly squeezed juices, to yummy desserts, and save tons of money on supermarket prices! Not only that, this superb tree will produce highly fragrant, white blossom during late spring and early summer. Wonderfully sweet, seedless limes will be ready for you to pick from October each year. To ensure you'll be picking delicious fruit year after year, we advise you keep your trees in their pots, and place in a sunny, sheltered position. Protect from frost during the winter time either by bringing indoors into a conservatory, or by covering with a plant cosy. Citrus tend not to thrive in centrally heated homes, so from mid-June to late September, give plants a treat and transfer them outside to make the most of the available sunshine - but remember they are not frost tolerant so will need bringing under cover if cold nights threaten. In summer, water freely - ideally with rainwater, while in winter you can reduce the amount - allowing the surface to partially dry out before watering again. Always allow excess water to drain away as overwatering in winter is one of the commonest problems, so err on the dry side.